As I understand it, the EU27 leadership made the UK a conditional offer with various options to extend the Article 50 negotiation period. Who has to act to accept and enact the extension? Can the UK government accept it on behalf of the UK or do they legally need an act of parliament first? Once the UK selects one option, do the EU27 governments have to formally accept it or has this acceptance been given in advance? Do any of the EU27 governments need parliamentary approval before they can act? Can this be done by phone or does it require physical letters which must be delivered and accepted? The European Council has already agreed to both dates so they don’t need to ratify anything any more. A new UK Act isn’t required. The UK Government can put forward a Statutory Instrument to amend the existing Withdrawal Act. This does need to pass both Houses of Parliament but this is unlikely to be blocked. In both cases, confirmation in writing will be given but that’s just a formality. 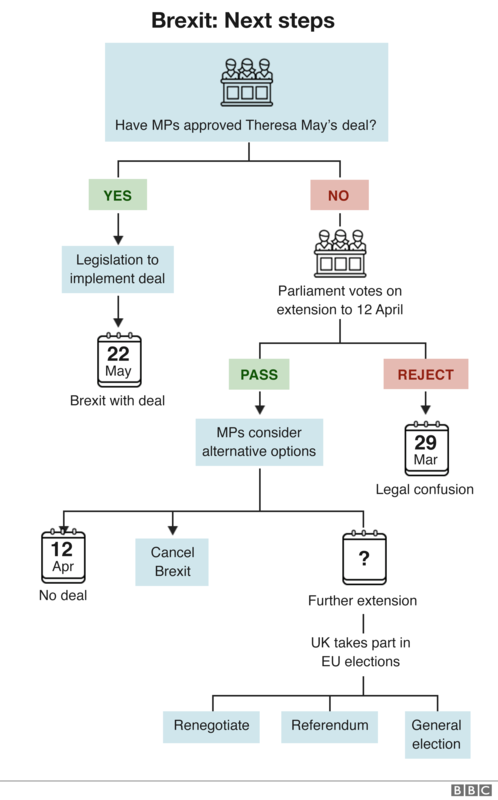 Which date applies depends on whether the Withdrawal Agreement bill is passed by the UK Parliament. If it is, then a May 22nd date will apply to allow all the necessary legislation to be passed. If not, then the UK Government will leave the European Union on April 12th unless they come to an alternative agreement before then. They need an act of parliament. Not so much because of the change in the withdrawal act, but because they made a law in the UK which mentions that the UK will leave the EU on March 29 2019. That law needs to be withdrawn or modified. It's unclear ("legal confusion" below) what happens if parliament rejects this. Note that unilateral revocation by simple letter of the Prime Minister remains an option. Not the answer you're looking for? Browse other questions tagged united-kingdom brexit article-50 or ask your own question. Can the Government enact the withdrawal bill without parliament's approval? Who made this comment about Brexit and in what context? Did the EU Referendum Act 2015 mandate “the leaflet”?